As Arsenal travel to Monaco in a bid to overturn a 3-1 deficit from the first leg, they will be playing in one of the more unusual football grounds in Europe. Monaco is one of 125 soccer cities featured in Libero, the digital travel guide for football fans. Regularly refreshed with new destinations and the travelogue Soccer Sagas, Libero is a one-click treasure trove of football trip tips, tales and trivia. See www.liberoguide.com. Arsenal’s season turns on Arsène Wenger’s return to the club where he made his name: Monaco. This tiny principality is a footballing anomaly. A miniscule city-state squeezed between France, Italy and the Mediterranean, this tax haven made its own name from high-rolling recreation from the late 19th-century onwards. After casinos came Formula One, the Monte Carlo Rally, and… AS Monaco. 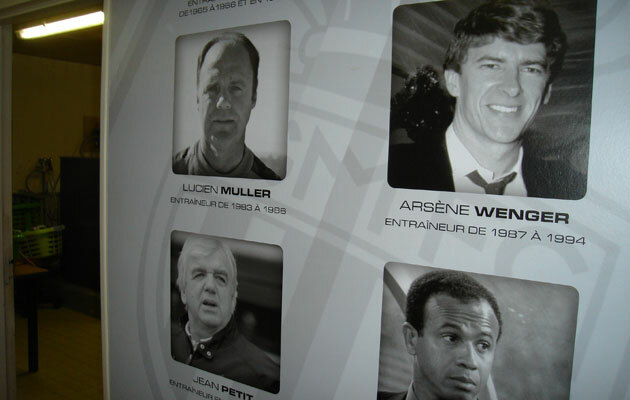 Formed in the roaring twenties around the same time as the first Grand Prix, the club gained international recognition under Wenger. Youths such as Thierry Henry and Lilian Thuram turned out in the distinctive red-and-white shirts, along with stars Glenn Hoddle and George Weah. 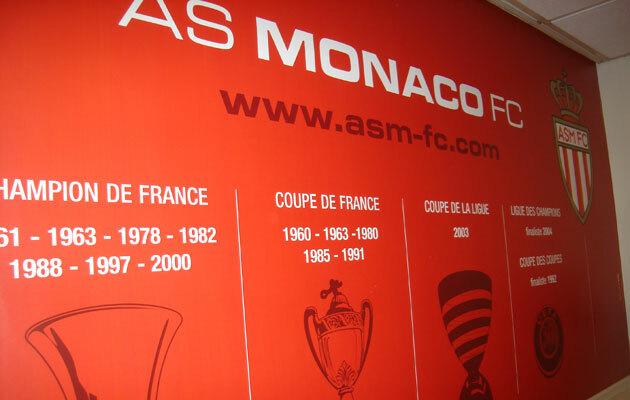 Quarter-finalists, semi-finalists then finalists in various European competitions, Monaco were an exciting team to watch – and based at a newly built Stade Louis II. It was Louis II, husband first to a cabaret singer then an actress, who introduced organised sport to the principality. The football club was formed in 1924, the Grand Prix inaugurated in 1929. Ten years afterwards, a simple, one-stand stadium was opened in the district of Fontvieille. Creating a modern version alongside was part of a major project of land reclamation, 22 hectares in all, which expanded the surrounding area of Fontvieille. The stadium occupies only three hectares – the central part of Trafalgar Square covers one – so architect Henri Pottier was forced to find savvy solutions to Monaco’s space problems. Set on several storeys of car park, offices, a sports hall and Olympic-sized pool, the pitch is surrounded by roofed stands on three sides, each containing floodlights. On the open, harbour side, nine arches lend the stadium with its signature look. 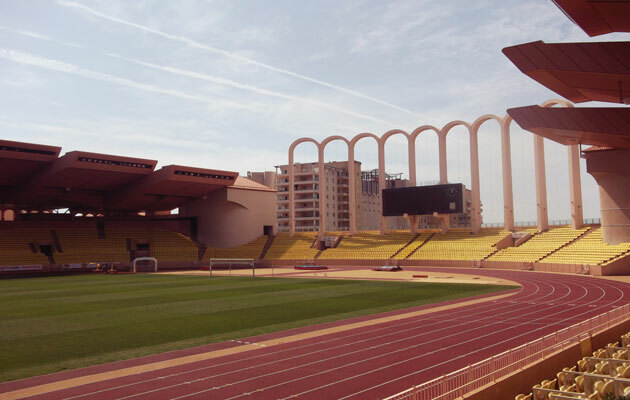 Surrounded by a running track, the Louis II has been a stage for major international athletics meets as well as UEFA Super Cup finals until 2012. Given that the entire population of Monaco is under 40,000, full houses are rare. The average attendance for 2013-14 barely totalled 9,000 – to watch €150 million worth of talent. With AS Monaco facing third-flight football in 2011, monarch-owner Albert II agreed to sell two-thirds of his family’s shares to Russian potash billionaire Dmitri Rybolovliev. After promotion in 2013, by splashing out more than €150 million, €50 million on top Colombian striker Radamel Falcao alone, Rybolovliev went toe-to-toe with Qatari-backed Paris Saint-Germain. Success has been by no means immediate – and, in the meantime, Rybolovliev has been involved in the most expensive divorce in history. A run to the final of the Champions League may just reverse the Russian’s fortunes. On Tuesday night, Arsenal fans are allocated sectors H, accessed through gate H, at the Cap d’Ail end of the ground under the famous arches. These are the Populaires, opposite what passes for a home end, the Pesages. Prince Albert II and VIP guests are accommodated in the Tribune d’Honneur alongside the Populaires. 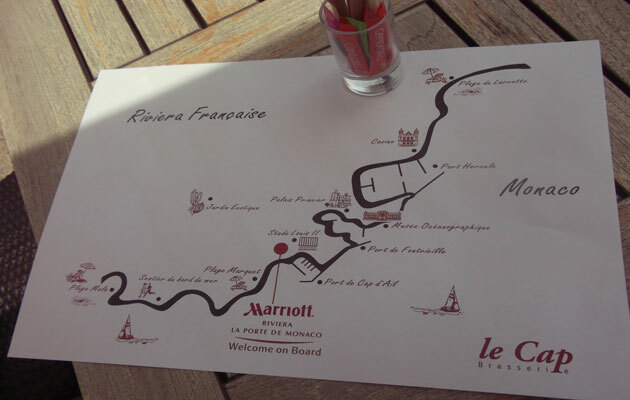 Walk five steps from the nine arches of the Stade Louis II to the Riviera Marriott Hotel opposite for a pre-match cocktail and you’re in France. 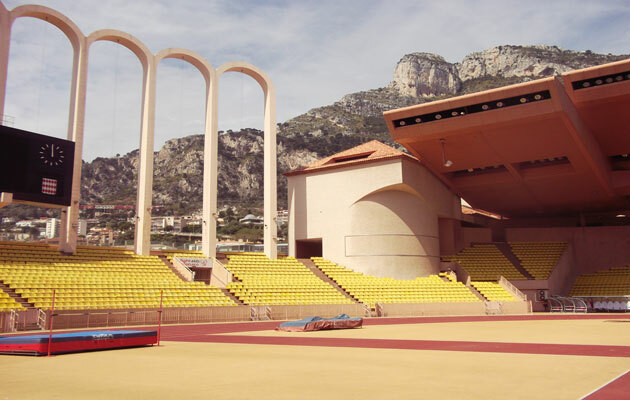 The stadium is set in the western district of Fontvieille, at the border between principality and Metropolitan France. Alongside spread out high-end hotels, luxury yachts and a heliport. Welcome to the home of the highest number of billionaires in the world per capita. The nearest airport is Nice, 20km away. From there, you have the choice of helicopter (every 30mins, online €105.74, 7min flight time) or No.110 bus (hourly, journey time 20min, €20/€30 return). 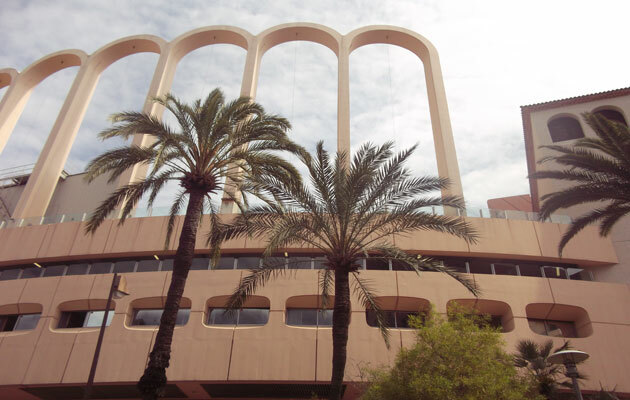 The bus stops at Stade Louis II (Hotel Marriott) except on busy match days. Central Taxi Riviera Nice (+33 4 93 13 78 78) charges around €75-90 from Nice airport to Monaco, depending on time of day. Taxi Monaco Prestige (+377 93 15 01 01) has a flat rate of €90 – for a limousine. A train www.sncf.com runs from Nice Riquier (15min, €3.30) to Monaco-Monte Carlo. There’s no station building at Monte-Carlo, just a series of exit levels. Boulevard de Belgique leads straight to bus No.5, Port Boulevard Albert Ier leads to bus No.6 – both heading for Fontvieille (every 10min, 10min journey time). A machine at Monte-Carlo station/bus stop dispenses tickets (€1.50, €5 day pass, touch in on board). It’s otherwise €2 on board. The bus service shuts down about 9.30pm, after which there’s a one-line night service. Note that for the Arsenal game, an extra train is being laid on from Monte-Carlo to Nice at 11.45pm, rescheduled to 1am should the game go to extra-time. Around the principality, Taxi Monaco (+377 8 20 20 98 98) offers a 24-hour service. The Fontvieille stop is near the main stand. Arsenal’s ticket allocation has long sold out. For the home end or neutrals, tickets are still available on the club’s website. For domestic fixtures, sell-outs are rarely a problem. Prices ranges from around €60 in the Tribune d’Honneur to €30 in the facing stand (‘Premières’) and €20 in the Secondes alongside. There’s a match-day ticket office open behind the main stand – tickets behind the goals in the Pesages and Populaires are around €10-€15. The surprisingly modest ASM shop (Mon-Sat 10am-7pm) is just above the Port de Monaco at rue Grimaldi 16, with archive black-and-white photos of Prince Rainier and Princess Grace in the window. French-language stadium tours (+377 92 05 40 20; €5/€2.50 under-12s, cash only) take place Wed-Sun at 10am, 11.30am, 2.30pm and 4pm. A grey-suited official leads the tour around the various sports facilities – a royal box in every one – and, via the roll of honour and dressing rooms, onto the pitch itself. English-language visits can be requested – the efficient guide can deal with questions in both languages. A stylish feat of engineering by Cap d’Ail harbour where Monaco meets France, this 18,500-capacity stadium is set beside the original Louis II, also named after the prince who ruled either side of World War II. Gone, sadly, with all the new residential housing, is the unpretentious L’Equipe Bar on passage Kléber, so pre-match options are limited to upscale terraces overlooking Cap d’Ail harbour. These include le Cap Brasserie, part of the Marriott Riviera hotel and Dock’s Café, both with pricy food and cocktails on offer. 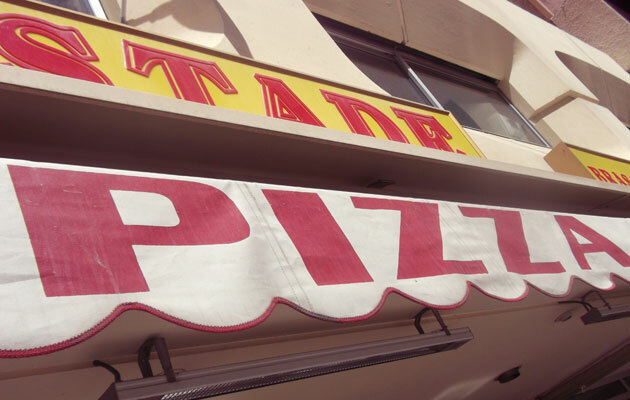 At the stadium, Brasserie La Pizza du Stade behind the home end also opens through the week, with seats outside.